Also find Attachment A (27 pages); copies of a long-hand chronology I've been making since November 26th or so on legal pads as things occur. While I have some other diagnoses (see Attachment D), the main ones are bi-polar disorder and major depression. I also probably suffer PTSD at this point. When I have anxiety/panic attacks and begin too tremble, and I focus on stopping the trembling and the attack, my eyes roll back in my head. 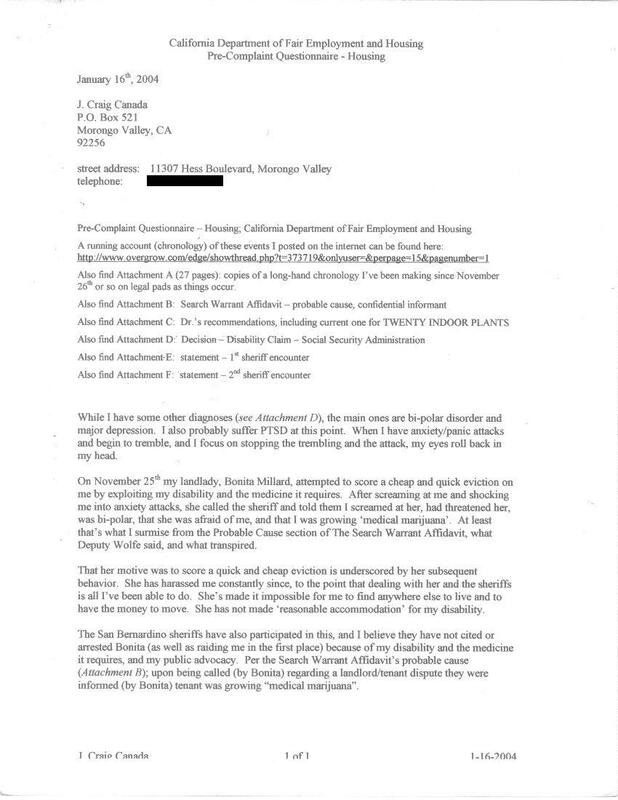 On November 25th my landlady, Bonita Millard, attempted to score a cheap and quick eviction on me by exploiting my disability and the medicine it requires. After screaming at me and shocking me into anxiety attacks, she called the sheriff and told them I screamed at her, had threatened her, was bi-polar, that she was afraid of me, and that I was growing 'medical marijuana'. At least that's what I surmise from the Probable Cause section of The Search Warrant Affidavit, what Deputy Wolfe said, and what transpired. That her motive was to score a quick and cheap eviction is underscored by her subsequent behavior. She has harassed me constantly since, to the oint that dealing with her and the sheriffs is all I've been able to do. She's made it impossible for me to find anywhere else to live and to have the money to move. She has not made 'reasonable accommodation' for my disability. the San Bernardino sheriffs have also participated in this, and I believe they have not cited or arrested Bonita (as well as raiding me in the first place) because of my disability and the medicine it requires, and my public advocacy. Per the Search Warrant Affidavit's probable cause (Attachment B); upon being called (by Bonita) regarding a landlord/tenant dispute they were informed (by Bonita) tenant was growing "medical marijuana".